In early stages of ripening. Grancasale characterises the production of Verdicchio dei Castelli di Jesi by CasalFarneto Wine Estate. Grancasale, meaning “big farmhouse”, is a figurative reminder of the ancient farmhouse from which the winery was built. Rich of mineral and citrusy nuances, very elegant, soft and fresh, Grancasale undergoes an attentive selection of clusters and a scrupulous processing in the winery to enhance its smelling sensations. 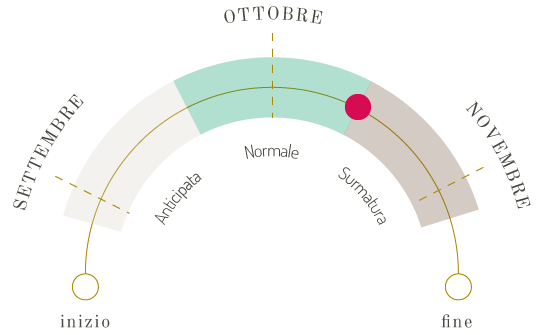 Grancasale is produced in the hilly inland of central Le Marche, in a soil of medium consistency with southeast exposure. Clusters, selected and harvested by hand in mid-October, are carried to the cellar in small baskets to keep the grapes intact. Here, the fermentation process is carried out with the cold maceration of the grapes’ skin with its own must (“cryomaceration”). The refining period involves preservation in steel, and a small part in big wooden barrels, for six to eight months, finally in bottles for another 12 months. Perfume: Persistent citrus aromas, geranium and white peach. Flavour: Well structured, elegant, harmonious, with fresh fruity and floral aromas in the foreground and scents of yeasts in the background. All highly elaborate fish dishes, first dishes with white sauces and cheeses, white meat, mature cheeses, truffle and mushroom based dishes. In this case, to obtain highly structured wines, harvest occurs in the second half of October, when clusters have reached a high stage of ripening. Wines produced from this type of late harvest will surely be full-bodied and enhanced in their softness and structure.